We have access to a vet 24 hours a day, 7 days a week. 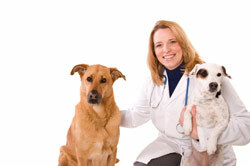 If any medical problem arises, your vet is our first point of contact as they will have your pets medical history. Depending on circumstances, ie distance etc, we will determine where it is best for your pet to be treated. We welcome your advice and knowledge of your pet as to possible triggers for illness or if they have had an allergy etc before. The more you can tell us about your pet will ensure that we can give your pet the best possible care.